We’d love your help. Let us know what’s wrong with this preview of 風之谷 2 by Hayao Miyazaki. To ask other readers questions about 風之谷 2, please sign up. Looks like the big introduction finished. I'm really looking forward to the events that will follow. It's almost impossible for a two part work to be so magnificent, and yet Nausicaa manages to be just that. I usually just, to quote a friend, ingest graphic novels, and the reason I was able to finish my 2017 reading goal so quickly was largely because of them. Nausicaa has been a challenge because in order to appreciate this book the reader is forced to slow down and observe the detail that is packed into every frame of this incredible book. Miyazaki manages to fill his world with people, creatu It's almost impossible for a two part work to be so magnificent, and yet Nausicaa manages to be just that. I usually just, to quote a friend, ingest graphic novels, and the reason I was able to finish my 2017 reading goal so quickly was largely because of them. Nausicaa has been a challenge because in order to appreciate this book the reader is forced to slow down and observe the detail that is packed into every frame of this incredible book. Miyazaki manages to fill his world with people, creatures, and botany that never ceases to demonstrate his attention to detail nor his unrelenting ability to amaze. Nausicaa creates an entirely separate world that one could spend a lifetime exploring and trying to understand. What makes the second volume of this book so amazing is that while the first book made it's focus the biology of the world in this post-apocalyptic planet, the second book manages to focus more of the impact of war and the philosophy of humanity itself. What is life and death and what is makind's relationship to both. Does humanity hurt or help the world. And what exactly are human beings willing and able to do to survive. These questions are put forth in such a way that, as the reader follows Nausicaa and her friends, they are able to muse on these questions while also following a beautiful story. I didn't quite understand this one, but the artwork and action made it fun to read nonetheless. I won't be continuing this any time soon. I got so confused and will need to start from the beginning..
Something quick to be absorbed in little over an hour, I am fascinated by how this young girl is going to be a hero for many people. Sigo enamorada de la obra de Miyazaki y solo me han entrado más ganas de leer el próximo volumen. El diseño, claramente, sigue con la misma calidad. El único pero que tiene este cómic es que, al menos para mi, a veces es un poco confuso. No sé cuando son los Durku y cuando son los de Tormekia o qué avión está atacando o qué personaje es el nuestro. Un poco confuso pero se puede leer perfectamente, y se debe leer! Tengo muchas ganas de terminar esta historia y de ver la adaptación de Ghibli. This is where you see a clear distinction between the movie and the manga and you realize that the movie, as good as it is, is only a tiny fraction of the amazing world Miyazaki has created. This series is absolutely brilliant. Tuulen laakson Nausicaän toinen osa on täynnä sotaa, petturuutta, syitä ja seurauksia. Valtavia oomurivistöjä, mielikuvituksellisia lentokoneita ja julmuutta. Ihmisen kamppailua luontoa vastaan, luonnon kanssa ja luontoa hyväksi käyttäen. Miyazakin kynän jälki on upeaa. Kerronta on paikoitellen hieman epäselvää ja joitain sivuja piti lukea useampaan kertaa ja hieman selata alkuunkin päin, jotta pysyi kartalla. Mustavalkoisessa albumissa on myös ensimmäisen osan tapaan hieno kolmitaitoksinen värili Tuulen laakson Nausicaän toinen osa on täynnä sotaa, petturuutta, syitä ja seurauksia. Valtavia oomurivistöjä, mielikuvituksellisia lentokoneita ja julmuutta. Ihmisen kamppailua luontoa vastaan, luonnon kanssa ja luontoa hyväksi käyttäen. Mustavalkoisessa albumissa on myös ensimmäisen osan tapaan hieno kolmitaitoksinen väriliite, joka ei tällä kertaa ollut informatiivinen edellisen kartan tapaan, mutta hieno lisä silti. My experience of reading Nausicaa this time round is a bit of a jolt. I collected the old Viz issues assiduously when they came out, and read and reread them, but there were big gaps in my collection and big gaps of time between new issues. When I got these collections over a few years for my son I never got around to sitting down and reading the whole lot until now, and it is really hard to stop once started. Nausicaa and Asbel escape from the forest only to be captured by a lurking Dorok ship w My experience of reading Nausicaa this time round is a bit of a jolt. I collected the old Viz issues assiduously when they came out, and read and reread them, but there were big gaps in my collection and big gaps of time between new issues. When I got these collections over a few years for my son I never got around to sitting down and reading the whole lot until now, and it is really hard to stop once started. Nausicaa and Asbel escape from the forest only to be captured by a lurking Dorok ship which is part of a trap being sprung on Kushana's southern maneuver. The flotilla is crossing the forest, stopping at a clearing of acid lakes, where it encounters a Dorok force who are torturing a baby Ohmu to draw a mass of the adult insects down on the encampment. Nausicaa is appalled at the reckless cruelty of the trap and escapes, as much to stop the torture as to save the flotilla. So interesting to see which parts of the manga made it into the film, and which were modified or cut out entirely. The world of Nausicaa is so much larger than most people know about. I love Nausicaa, she's fierce but gentle, and I admire her perseverance through the horrors she faces. Hayao Miyazaki is indeed a genius. This was a great volume! I've discovered that the movie only covers volumes 1 and a 3/4 of volume 2. I can't wait to see what happens in volume 3. Onwards and forwards I plod amongst this book's pages. Omnomnom. Les guerres font rage et les complots pour le pouvoir font oublier aux hommes leur lien avec la nature au point de l'utiliser comme arme. Nausicaä poursuit sa quête sur le vaisseau tolmèque pour découvrir ce que l'empire dork manigance. Yupa et Asbel se retrouvent embarquer dans un conflit clanique en lien avec le frère jumeau de l'empereur, doté de capacités surnaturelles. Un tome riche en événements et en information sur ce monde complexe et sombre. Emouvant et une fois encore parfaitement men Les guerres font rage et les complots pour le pouvoir font oublier aux hommes leur lien avec la nature au point de l'utiliser comme arme. Nausicaä poursuit sa quête sur le vaisseau tolmèque pour découvrir ce que l'empire dork manigance. Yupa et Asbel se retrouvent embarquer dans un conflit clanique en lien avec le frère jumeau de l'empereur, doté de capacités surnaturelles. Another awesome volume. I love the full color fold outs at the beginning. Miyazaki is a wonderful artist. His drawing is very simple, probably the simplest I have seen, but he tells a story so well. Usually, I despise politics in my stories, and heavy handed stories too, so I would not think I would like this because it is very political at times, and the save our earth and animals can be heavy handed, but it feels natural to this story. I am mad my library does not have 5 and 6! With this volume, we've effectively left the movie behind (except for one plot point that will likely come up later). This volume was a great combination of action, suspense, world-building, and character development! This volume is just as good as the first, although the plot gets a little bit more dense and difficult to follow. The art is still gorgeous though and I'm looking forward to finally reading the next volume sometime soon. There are lots of things I'd like to love about this series, but equally as many I'm just not on board with. The fact that the storytelling is just frankly subpar seals the deal for me; I'm 40% of the way in and I'm still having a hard time figuring out the broad strokes of what's going on. Finally got around to reading vol 2. The plot is definitely growing in complexity, as is the cast, and I'm really looking forward to seeing how it goes from here. I like the movie more so far, but this is good too. There’s a lot more background and depth in the manga version. There are 3 or 4 individual frames in this one that are worthy of framing and hanging on the wall. It also has one of my favorite story elements, you can't be sure of where the story is going. Enjoyed the old ruins in this second book and the story line. This one ended on a cliff hanger!! I need the rest! Hopefully my library will have them! Such an incredible story. I hope the movie is just as good. Okay but this introduction is way too long & i feel so lost. Don’t plan on continuing after this. 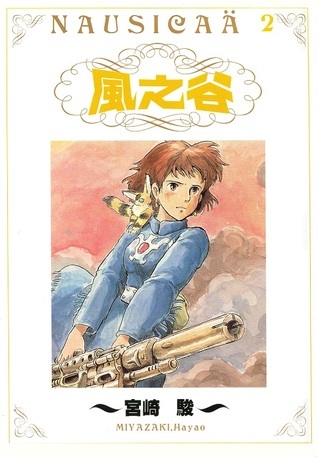 The second volume of the story of Princess Nausicaa, this widens and deepens the canvas of the story, showing us some more history of the world and more of the politics and factions that populate it. Nausicaa and the supporting characters are wonderfully drawn (metaphorically and literally) and the story keep hinting at more in an organic way that draws you in. Miyazaki's tale of the dangers of ravaging the earth is poignant but never overbearing and I look forward to reading more of it. In this volume we get to meet the antagonist of Nausicaa. It appears the doom hanging over the world is bigger than just a war between two large empires. As Nausicaa tries to figure out what is happening, she comes closer to the front lines. Can Asbel and Yupa reach her in time to help her? The story is very interesting. You get a sense of impending doom. The world Miyazaki is building becomes more interesting with every frame you see. This review has been hidden because it contains spoilers. To view it, click here. I'm reading these in succession and it just keeps getting better and better with every passing page. And the characters are growing and fleshing out in ways that I didn't expect. The movie only scratches the surface; this manga brings in a whole slue of opposing viewpoints and factions fighting for one thing: survival and control. And poor Naussica is stuck right in the middle- only wanting peace between kingdoms, people and the Toxic Jungle.